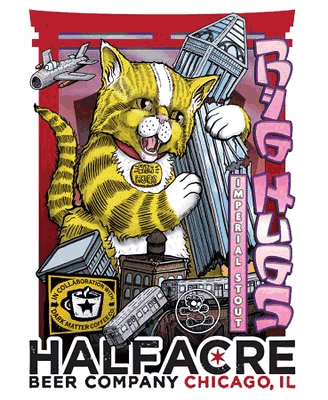 So Chicago's Half Acre Brewing is one of those that consistently puts out interesting, novel, and often disturbing label art. I'd say it's punk-influenced, but that doesn't seem right because, unlike, say, Three Floyds (with whom Half Acre has been known to consort), there are no traditional punk elements. Rather, the artwork just seems intended to sort of screw with you. More than anything, they remind me of dystopian works, where the future (or parallel present) is a darker, twisted version of things as they are. As we'll see, they tend to achieve this discomforting effect by juxtaposing very different ideas. So it's like Clint Eastwood as Abraham, except that instead of tying Isaac to an altar, he gives him a lightning lasso and a .357 revolver, and lets him ride a buffalo? Or maybe the kid is Death from Revelations ("I looked and I beheld a pale bison")? The color scheme here is pure dystopia. Barren brown wasteland, lightning storm from grey skies, slightly bluer grey clothing, aforementioned pale grey plains beast that's looking sadly (and quite human-ly) out at us... all grim and a little scary. It's impressive that everything is distinct and ever stands out, despite a really limited color palette. Here, the juxtaposition was the use of the father-and-happy-son, in Western garb, with the TS Elliot-meets-Book of Eli backdrop. 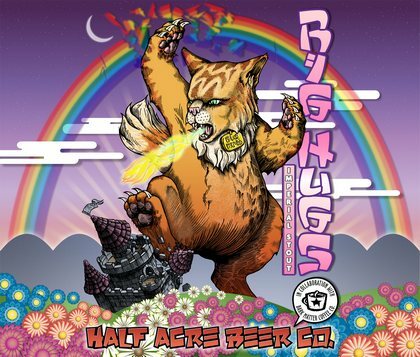 Next, the Big Hugs Imperial Stout label art was... changed. Mmkay. Lots of red and pink, almost Valentine's Day-esque, but, you know, with a kitty smashing Chicago. Way more Japanese influences. It looks like something out of Katamari. But the bright colors, the monster kitty now smashing a rainbow and castle, and the fake-Asian lettering are all hallmarks of a Japanese pop aesthetic. Compositionally, it's a little better, but the real change is in the vibrancy of this large and strange image. Now, we're juxtaposing bright happy rainbows and colors and flowers with destruction in the form of a gigantic adorable fire-breathing cat. Sensical or no, it's effective. Okay, nice. Sort of an early-1900s Germanic thing going on, with some subtly unsettling undertones, like Fritz Lang's Metropolis meets Slaughterhouse Five. Is that dirigible for military or transport purposes? Limited colors, retro design... pretty straightforward, right? Well, as the artist said: Really happy with this design as it's coming along. The sad part is it's a pattern tile and 99% of the people who have it in their actual hands won't even notice it." It's okay, Phineas. Can I call you Finn? Thanks. This is what the Pour Curator is here for. The zeppelin is probably the most focal image in the piece, other than text, and we can see now that it floats in a sky of strange figurative tiles. What could those be? So it's an owl on top of a squid, holding a sign with the brewery's name. Have to admit, didn't see that coming. That, friends, is juxtaposition and disturbing stuff. 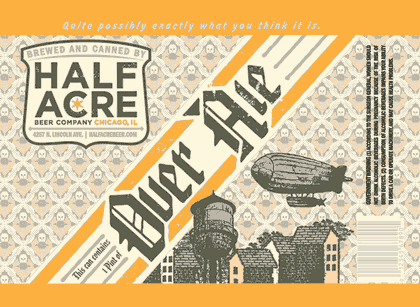 Contrary to the text that it is "quite possibly exactly what you think it is" I have to say that the intricacies of Half Acre's art are in fact very surprising and strange. 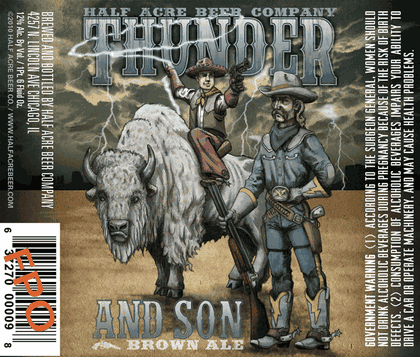 It's cool work, and I'm confident Half Acre will continue to crank out interesting stuff. It is proof that common thoughts about macro marketing schemes don't always apply to niche markets like craft beer. Google Sightseeing has an international breweries tour if you don't have the time to go to Denmark or Dublin. Jay Zeis, a fellow PA resident who blog at A Beer in the Hand Is Worth Two in the Fridge has started a blog dedicated to Homebrew Labels. Just catching up on my blog reading. Thanks for the shout out. If you ever want to make a guest post on the beauty of Homebrew Labels, you are more than welcome.